Galaxies Colliding - Universe Galaxies And Stars Section. New View of Colliding Galaxies. The W.M. Keck Observatory in Hawaii took this photograph of two Galaxies about to collide over 5 billion light-years away from us. The image was possible because of the new laser guide star system for adaptive optics which corrects the distorting effects of the Earth's atmosphere. This allows Keck to have nearly the same view as space-based observatories like Hubble. Both Galaxies in this collision are mature, and seem to have used up all their gas. This won't create spectacular amounts of new star formation, which is what happens with less mature galaxies. For the first time, Astronomers have been able to combine the deepest optical images of the universe, obtained by the Hubble Space Telescope, with equally sharp images in the near-infrared part of the spectrum using a sophisticated new laser guide star system for adaptive optics at the W. M. Keck Observatory in Hawaii. The new observations, presented at the American Astronomical Society (AAS) meeting in San Diego this week, reveal unprecedented details of colliding Galaxies with massive black holes at their cores, seen at a distance of around 5 billion light-years, when the universe was just over half its present age. Observing distant Galaxies in the Infrared range reveals older populations of stars than can be seen at optical wavelengths, and Infrared light also penetrates clouds of interstellar dust more readily than optical light. The new Infrared images of distant Galaxies were obtained by a team of researchers from the University of California, Santa Cruz, UCLA, and the W. M. Keck Observatory. Jason Melbourne, a graduate student at UC Santa Cruz and lead author of the study, said the initial findings include some surprises and that researchers will continue to analyze the data in the weeks to come. "We have never been able to achieve this level of spatial resolution in the Infrared before," Melbourne said. In addition to Melbourne, the research team, led by David Koo of UCSC and James Larkin of UCLA, includes Jennifer Lotz, Claire Max, and Jerry Nelson at UCSC; Shelley Wright and Matthew Barczys at UCLA; and Antonin H. Bouchez, Jason Chin, Scott Hartman, Erik Johansson, Robert Lafon, David Le Mignant, Paul J. Stomski, Douglas Summers, Marcos A. van Dam, and Peter L. Wizinowich at Keck Observatory. "For the first time in these deep images of the universe we can cover all wavelengths of light from the optical to the Infrared with the same level of spatial resolution. This allows us to observe detailed substructures in distant Galaxies and study their constituent stars with a precision we couldn't possibly obtain otherwise," said Koo, a professor of astronomy and Astrophysics at UCSC. The images were obtained by Wright and the Keck AO team during testing of the laser guide star adaptive optics system on the 10-meter Keck II Telescope. They are the first science-quality images of distant Galaxies obtained with the new system. This marks a major step for the Center for Adaptive Optics Treasury Survey (CATS), which will use adaptive optics to observe a large sample of faint, distant Galaxies in the early universe, said UCLA's Larkin.
" We've worked very hard for several years taking data around bright stars. But we have been very restricted in terms of the number and types of objects that we can observe. Only with the laser can we now reach the richest and most exciting targets." Larkin said. Adaptive optics (AO) corrects for the blurring effect of the atmosphere, which seriously degrades images seen by ground-based telescopes. An AO system precisely measures this blurring and corrects the image using a deformable mirror, applying corrections hundreds of times per second. To measure the blurring, AO requires a bright point-source of light in the telescope's field of view, which can be created artificially by using a laser to excite sodium atoms in the upper atmosphere, causing them to glow. Without such a laser guide star, Astronomers have had to rely on bright stars ("natural guide stars"), which drastically limits where AO can be used in the sky. Furthermore, natural guide stars are too bright to allow observations of very faint, distant Galaxies in the same part of the sky, Koo said. "The advent of the laser guide star at Keck has opened up the sky for adaptive optics observations, and we can now use Keck to focus on those fields where we already have wonderful, deep optical images from the Hubble Space Telescope," Koo said. Because the diameter of the Keck Telescope's mirror is four times larger than Hubble's, it can obtain images four times sharper than Hubble in the near Infrared now that the laser guide star adaptive optics system is available to overcome the blurring effects of the atmosphere. The images being presented at the AAS meeting were obtained in an area of the sky known as the GOODS-South field, where deep observations have already been made by Hubble, the Chandra X-ray Observatory, and other telescopes. There are six faint Galaxies in the images, including two X-ray sources identified by Chandra. The X-ray emissions, combined with the disordered morphology of these objects, suggested recent merger activity, Melbourne said. Mergers can funnel large amounts of matter into the center of a galaxy, and X-ray emissions from the galactic center indicate the presence of a massive black hole that is actively consuming matter.
" 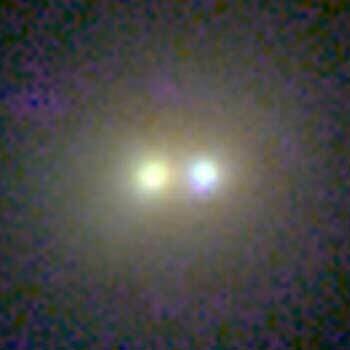 We are now fairly certain that we are seeing Galaxies that have undergone recent mergers," Melbourne said. "One of these systems has a double nucleus, so you can actually see the two nuclei of the merging galaxies. The other system is highly disordered - it looks like a train wreck - and is a much stronger X-ray source." In addition to lighting up the galactic nucleus with x-ray emissions, mergers also tend to trigger the formation of new stars by shocking and compressing clouds of gas. So the researchers were surprised to find that the system with a double nucleus is dominated by relatively old stars and does not appear to be producing many young stars.
" If we are right about the merger scenario, then this merger is occuring between two Galaxies that had already formed most of their stars billions of years before and did not have a lot of gas left over to make new stars," Melbourne said. If additional study shows that such objects are common further back in time, these observations could help explain one of the puzzles of Galaxy formation. According to the prevailing theory of hierarchical Galaxy formation, large Galaxies are built up over billions of years through mergers between smaller galaxies. Since mergers trigger star formation, it has been difficult to explain the existence of very large Galaxies that lack significant populations of young stars. "One idea is that you can have a so-called dry merger, where two Galaxies full of old stars but little gas merge without forming many new stars. What we are seeing in this object is consistent with a dry merger," Melbourne said. "Even in a dry merger, there may still be enough gas to feed the black hole, producing X-ray emissions, but not enough to yield a strong burst of star formation." Further observations at mid- to far-infrared wavelengths, expected later this year from the Spitzer Space Telescope, may help confirm this. The Spitzer data will provide a better indication of the dust content of the galaxy, a crucial variable in interpreting these observations, Melbourne said. The laser guide star adaptive optics system was funded by the W. M. Keck Foundation. The artificial laser guide star system was developed and integrated in a partnership between the Lawrence Livermore National Laboratory and the W. M. Keck Observatory. The laser was integrated at Keck with the help of Dee Pennington, Curtis Brown, and Pam Danforth. The NIRC2 near-infrared camera was developed by the California Institute of Technology, UCLA, and the Keck Observatory. The Keck Observatory is operated as a scientific partnership among CalTech, the University of California, and the National Aeronautics and Space Administration. This work has been supported by the Center for Adaptive Optics, a National Science Foundation Science and Technology Center managed by UC Santa Cruz.